This is very nice. You should put it on kickstart and sell it with a wallwart. Forget the bench supply. I’d buy a couple. A very useful beginner project. As said before it could be a bit smaller. I’d make the traces bigger (fine traces are a pain to make using press n peel)and fill the remaining unused space with copper to avoid depleting ferric chloride innecesarily. Great hack and I love your website, too. This won’t be the last time you’re on Hackaday! actually this isn’t the first time she’s been featured. I don’t get what’s going on with those header pins in the picutre… they’re on the wrong side of the board. Sorry about the comment reported. The reply button is hidden underneath it. It would have been done that way so they could (easily) solder the pins in. They power the breadboard underneath, so by rights the black spacer should be underneath the board on the track side, but only being a single sided pcb that becomes very difficult to solder. Simple solution to an annoying problem. I like it. On her site you can see she has some wires running along those underneath. I imagine that if she but the nylon spacers underneath and then tried to solder wires there would have been problems or the headers wouldn’t have fit into the breadboard properly. Yep, they nailed it- it’s a single sided PCB, so I used extra long headers stuck in from the top so I could solder to the pads underneath. Also, there’s superglue holding the nylon tops to the PCB top for strain relief. The upside down header pins are a good trick; I’ve used it too. Did you know you can also slide the pins through the nylon spacer until it is at the very end of the pins? Thus: (1) no too-short-to-use stubby pins on the top side of your board and (2) don’t need to source extra long headers. I did not know that trick about sliding the header pins. Great tip! I’ll be doing that for sure next time. Very clever little device here. I agree this would be an excellent first project for somebody getting started in electronics, both because it is easy to do, and because a reliable source of power is extremely important when working with electronics (versus becoming frustrated when things don’t work like they should). Which also leads right into the suggestion of putting this up on Kickstarter; either as a complete product (with wall wart power, as mentioned) or as a kit. This is excellent – make a more compact, rugged version with over-current protection and shop it to SparkFun – you’ll easily sell hundreds. I’ve done something similar with a bottom-side approach: peel off the sticky foam under those breadboards and you can solder a specially-prepared PCB directly to the rails. I actually took it one step further and integrated an AVR ISP 6-pin header (mapped to certain pins to fit a ‘Mega48-328) and an adjustable voltage regulator. Yes, it doesn’t have a jumper for measuring current, but its damn handy for quickly throwing something together on a breadboard. One thing to consider is that not all breadboards are standardized in terms of the spacing between the rows and the busses, so some may not fit. And if you really want to supply unregulated power to your board, get a breadboard mounted next to some binding posts–really handy for breadboarding analog circuits when using a variable DC lab power supply and/or a low freq (<1MHz) function generator. That’s an useful thing to have. I just plug a 7805 in the breadboard an leave it in place, but I’m just lazy. The traces are awfully thin for a power supply though. It will heat a lot if you try to source a moderate amount of current. I’ve made a couple of these using plain stripboard, one that spread across to both power rails and another which was stuck to one corner to minimise space used. The biggest problem on one was that the spacing between the power rails and the center connections was not 0.1″ compatable. The main issue I have with the build pictured at the top of the page is that there’s a power switch that selects 5v or DC-in, because there’s too much of a potential to accidentally flip the switch and kill your components with the wrong voltage. I believe it should be a pin header+jumper solution, with pin header sockets so that you can work with +5v and or +3.3v and or DC-in for those projects where you’re running an IC @ 5v which can monitor/control things at say 12v. 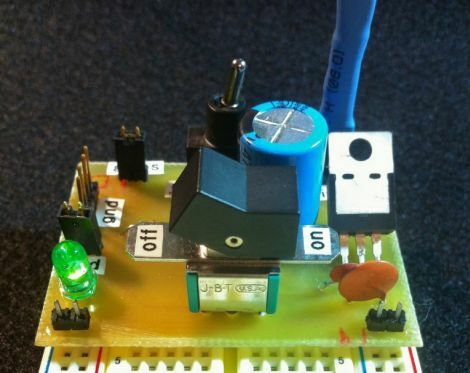 A breadboard power supply that plugs into the board is indispensable. I’ve bought them before, but it’s nice to see a home built one. My one criticism is that those traces look awfully small. Maybe it’s not a big deal, but that was my initial reaction upon seeing them. I would not have put the switch on there for unregulated supply. I think the use cases for it are vanishingly few compared to the heartache when a 5V circuit accidentally gets 12V. Most of the other breadboard supplies let you switch between 5V and 3.3V, which takes care of most of the typical circuits, and is less immediately disastrous if you get it wrong. Thanks for the tips, everyone! Version 2 will definitely have thicker traces. We’ll see how this goes. Also, regarding the 5v switch, I like the jumper idea. I agree that switching is pretty rarely needed. I did take the precaution of using a very stiff toggle for that, so it’s hard to hit it accidentally. I suspect it will live in the 5V position anyway. As for kickstarter, I concur with others that Sparkfun and Adafruit have very nice ones indeed. I just wanted to build one myself, use up some salvaged parts, and test out a new PCB etching technique. I saw your PCB etching entry on your blog. I will definitely try that out. I promise I won’t eat the chemicals though. Cool, let me know how it works for you. But i made a dual independent/tracking breadboard PSU a while ago. i May post it on hack a day sometime. Have anyone else seen a dual tracking breadboard PSU? or am i the first one to make one? Cause i can’t find any others. How standard are breadboard power rail widths? I bought a similar 3.3/5v power supply product from (a vendor who will not be named here), and it doesn’t quite fit on the breadboard I’m using, which is a basic vanilla Radio Shack or Sparkfun thing with red and blue rails down the sides. The pins in the center section of the breadboard are all standard tenth-inch spacing, but are the power rails the same standard, or do they vary by manufacturer? Good question. I measured my own to make this, so I can only say for sure that it works on Jameco’s house brand boards. That’s the spacing between the output headers that you’ll see on the PCB layout file attached to my post. Great project. Like any good project, the creeping featurism is an indication that it has a great deal of use. I’ve been doing this for many many years, and until I had good bench supplies, usually just tossed a 78xx regulator on the board. Now I have a cable that goes from a +/-12,+/-5,+3.3 supply at the top of the bench to a 6 pin 0.1″ header that gets plugged in at the top of the board I run all the strips run to there as appropriate.